Fearsome has taken up the real estate he does on my face un-interrupted since 2002.He was on and off and in various forms ever since he could grow and that was about 1980. He’s a very full beard and while usually on the larger side stayed somewhat trimmed. September of 2013 the trimming stopped and he grew and continues to do so. He now sits on my chest and has a developing personality that I’m am enjoying getting to know better. I am enjoying a stage in my life where I desire to get to know me better. I want to grow spiritually. I want to understand my soul better. Part of that is writing. With writing I go places I didn’t expect and they are recorded. From that I can grow, I gain deeper understanding. So in May of 2014 I embarked on naming Fearsome and starting this blog. It took a couple weeks of searching available names and ideas. A couple weeks of Contemplation. On June 1, 2014 it all came together and Fearsome had a name and a blog. I like the concept of my spiritual growth and Fearsome’s growth as interconnected. How long before Fearsome finds himself trimmed? One does not yet know. Sometimes one must trim the branches to strengthen the tree. So right now growing is what he’s is doing, as am I. We will each know when a trim of sorts will do us each good. So this here blog thingy is for fun and for growth. I feel that growth without humor is not healthy. I hope that the humor grows along with my spirit, my soul and Fearsome. Stick around and join the ride. I hope that some of my musings will help others like yourself along they way. Always remember that your input through comments is always welcome as they may help me, Fearsome and others who find themselves contemplating here. And always, always be Fearsome! ……a place for Beards to contemplate and grow their souls…. A number of the photos used for “Beard of the Day” posts were found on open public sites (Google images, Yahoo, various news sites etc.) if one of the pics is yours and you want it removed from this blog please comment on THE POST OF THE PIC ITSELF and the post, pic and your comment will all be removed from this blog. The same goes for the you tube video links, they were on YouTube and -since public- I only linked them, if you desire the link removed comment ON THAT PARTICULAR post and all will be removed. I do not fear the beard; although it is fierce! FYI – I added a link to your blog to mine. I have a pretty low volume blog so don’t expect to be swamped with new readers but thought I’d let you know. Drop a note if you’d prefer I not include the link and I will remove it. Good luck with your blog! I hope you enjoy it. Thank you! I am honored to be linked. I will be linking yours and Michaels as soon as I get on the phone with you two and learn how! you had me at the pix! such woofy goodness; I DON’T know how your spouse stands it all! I also wondered how long fearsome had been growing, since he was a baby when you visited philly (and me). there MUST be humor and music and food in life, or it ain’t worth living! I am pleased as punch and honored so to be witness of your blog’s inchoation. I hope this is a marvelous Journey for you. Best of wishes to you on your ‘inner’ travels. It’s the interior advancements that ultimately make the greater positive difference, both inside and out.. Thanks! I look forward to having you around here and seeing you over at The Gents as I learn that site. Don’t be a stranger! I might be strange…or unique…but never a stranger. Due to the undertaking of what writing gets contributed most of it ends up in various places within The Gents, predominantly at the Beard News arena. There are more spiritual/philosophical pieces in the Christian room that fit this audience and pretty much all else ends up at UncleDJs WorldWideWhiskers. The past nine days I’ve had four mind-blowing interviews with folks from Michigan, Florida, the UK and the Netherlands. I have been enjoying dropping in on your blog and learning a bit more about you, since we became acquainted, and learning a bit more about myself in the process. I appreciate having friends like you and “Uncle DJ” to help me see myself better. What a fantastic blog you’ve got here. I’ve really enjoyed reading through it. My blogs a little different but you might enjoy some of the recipes on the Hairy Grill page or you might just enjoy reading through the rest of the blog. Please have a read through. If your ever interested in working with a new bearded blogger, collab or some feature articles please don’t hesitate to get in touch. Don’t you ever dye that majestic beard. It’s funny, since I’ve been growing mine out, I’ve come in contact with a lot of like minded folks and gotten, “away from the snakes” as I like to say. Beards are polarizing for many folks, but the people who crack silly jokes get a smile and are easily sorted. The ones who appreciate us for who we are will be supportive, and that’s the best building block to an awesome relationship. Good to know you’re out there. I’m happy to share photos but will need a link, with your permission, to go and get one. love your blog and your taste in both men and beards!!! Fearsome is a great beard. I’ve never come across anyone before that named their beard. I had a beard about Fearsome’s length when I was single but I shaved it to make my wife-to-be happy. Grown it a few times but rarely get more than a month before I’d get whined at to shave. 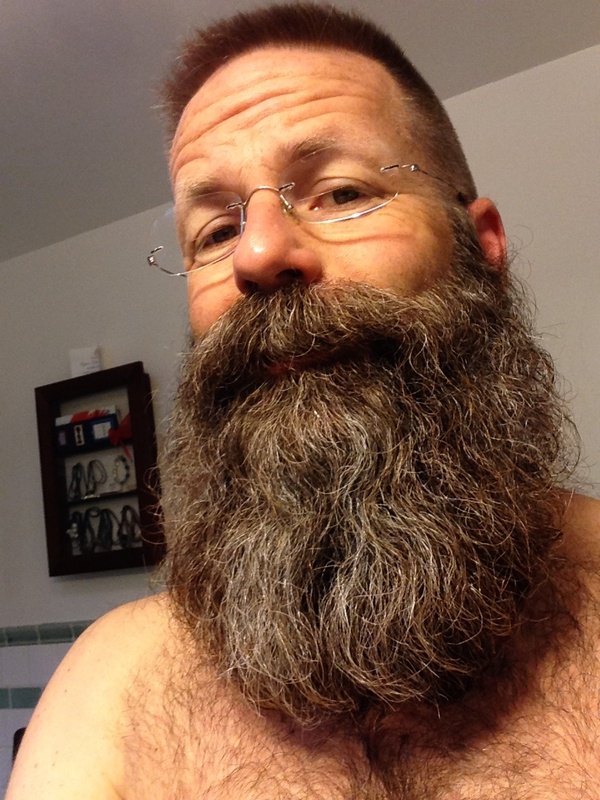 My wife is a beard-o-phobe but after 20 years of marriage I decided to say what the heck & grow it back 6 months ago. Clipped it short a couple of times since but have now decided to let it go wild for a while. Wonder what I could call mine? Robert perhaps??? Robert is a great name for a beard we thinks. Although slightly alarmed at first sight of Fearsome, my fear quickly turned to admiration. ‘He’s’ magnificent! 🙂 It’s like ‘he’s’ telling me to Be Bold! Be Courageous! Be Fearsome! I’m inspired. I look forward to growing with you both. Woo Hoo! Glad to have you along for the ride. funny word beards if you think about it…. I too am building mmy own zip code on my face. My beard is going on 7 months old. I need to name it too. I’m amazed how opinioned people can be about facial hair. The teenagers love it and give me compliments all the time. I have a feeling with this next generation, beards will be more common in the work place an d no so feared. Happy growing. Hi, Maintaining your is not easy. it takes lot’s of time and patients as well. using beard oil and other beard product make the hair healthy.